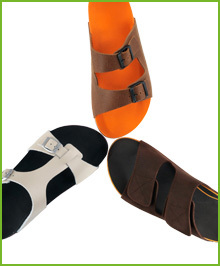 Alex works with German orthotic designers Pedcad who have developed the perfect footwear for Australians in summer. 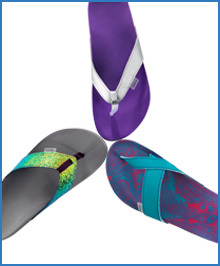 Valinos custom made orthotic thongs (Flip Flops or Jandals) and sandals are what all Podiatrists and people who wear orthotic devices have been dreaming of for years. The thongs are a custom made orthotic device made from your 3D foot scan. 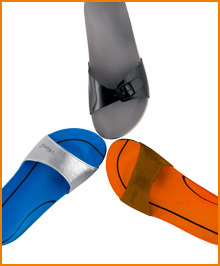 A sole and foot strap are then placed on the orthotic device, resulting in your very own custom made orthotic thong. A wide variety of colours are available to choose from and the orthotic itself can be made in different densities, ranging from firm cork to soft spongy material. View our gallery to see some examples of the latest designs, or the company website at www.valinos.de/en. 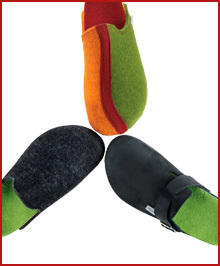 Our custom made Valinos shoes (above) are available in a number of different model varieties.